I don’t know about you, but whenever I unwrap a salmon fillet these days it seems to have grown to twice the size it looked in the fish shop. So I’ve started cutting them in half after barbecuing – the easiest way to cook salmon, I find – and keeping half in the fridge for lunch. Anyhoo, the other day I slung this little salmon nicoise salad together from leftovers and fridge staples. It pretty much only took as long to make as the egg took to hardboil (around eight minutes) – and, I have to say, was very fabulous. I used vino cotto instead of making a dressing, because I can kid myself that it’s got no oil (but I bet the sugariness of it cancels out that benefit…), but any dressing you like would be fine. This made a big salad for one, but obviously you can mix and match quantities to suit. Reckon it’s easy enough to stick in lunch for lazy people? Method: Chuck it all in. This will be a short post. I just wanted to show off the salad leaves grown in our garden. If I could only grow one thing, salad leaves would be it. These days it’s not hard to find beautiful tomatoes (in season), good herbs and so on; but there is absolutely nothing like the texture of salad leaves eaten within half an hour of picking – they are satiny, springy, silky and full of fresh flavour. Truly. Do it. To harvest, we use the cut-and-come-again method, just snipping off the outside leaves as needed, and gathering a mixture of different types of lettuce, some Asian salad greens, a bit of cress, some tiny beetroot leaves and a few herb leaves (basil, mint) each time. There are weeks when there’s nothing to take, of course, and then there is the time of plenty – best to stagger the plantings and plant new seedlings every three or four weeks. As soon as the lettuces start to go to seed – when they grow tall and gangly – the leaves begin to turn bitter, and I think that inadequate watering makes them bolt faster, so keep the water up and keep nibbling away at the outer leaves to get the best crop. Once I pick them as close to eating as possible, I stick them in this mini-sinkful of cold water for a good 10 minutes or so (ice cubes in the water if it’s a really hot day) and then spin them in the salad spinner (another girl’s best friend in the kitchen) to dry as much as possible, before either eating or tossing into a zip-seal plastic bag with plenty of air in it in the fridge. To me, the perfect salad dressing is 3 parts best olive oil to 1 part best balsamic vinegar, plenty of salt and pepper. But other friends make gorgeous dressings, especially my friend E, whose dressings I think always include raspberry vinegar. E, if you’re out there, can you provide your secret? And the Empress is a fan of a little walnut oil in her dressing, I believe? And what about the rest of you; what makes your green salad spin? Those of you who’ve enjoyed the citrus couscous recipe I posted a while ago might be keen to try a new salad that I am totally loving at the moment. It’s a very slight bastardisation of a fabulous quinoa salad from Ottolenghi, the Israeli & Palestinian chef duo from London whose book and newspaper column combined are the most interesting source of vegetarian food I’ve ever found. 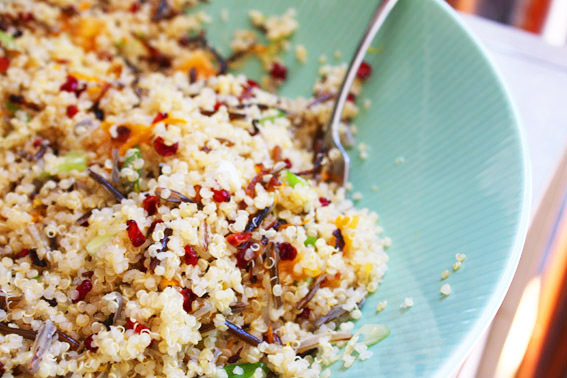 The original recipe, for Quinoa and Camargue red rice is here, and our adapted version below. My friend Caro first made this for me, using those craisins (dried cranberries) that are easily available in the supermarket, and I liked the slight sourness and the lovely ruby red colour so much I have done it with both craisins and the barberries I got ages ago on the Empress’s and my Persian excursion. Unlike craisins, however, I’ve found quinoa itself rather difficult to get hold of. I’m told it often resides in health food / organic shops, and I found mine at the Norton St Grocer, but I hope it becomes more freely available because it is my new favourite grain in the world. It’s pronounced ‘kin-wah’ and as far as I can tell you use it like couscous, but it’s much easier to manage as it doesn’t stick together as couscous can, and it has a delightfully bouncy texture and nutty flavour. I’ve learned that quinoa is an ancient ‘grain’ (but not really, as it’s not a grass but is more closely related to spinach – we eat the seeds) originating in the Andes, and best of all, it’s gluten-free so people with Coeliac disease and so on can enjoy with impunity. Excellent! Anyhoo. Enough lessons. On with the deliciousness. Bring to the boil two saucepans filled with salted water, and simmer the quinoa and rice separately: the first for 13 minutes, the second for up to 40, depending on how nutty and firm you like the texture. Drain both and spread out flat to cool more quickly. While the grains are cooking, fry the onion in a little olive oil until golden brown. Allow to cool. Soak the dried fruit in orange juice and zest in a bowl with all other ingredients except nuts and spinach/rocket. In an oven preheated to 170 degrees C, dry-roast the pistachios for up to six minutes or just until the colour changes. Check halfway through, because they can burn in an instant and the flavour is vile if they are even slightly overdone and you’ll have to chuck them out. Mix the cooked grains with all other ingredients and season generously, adding a little swizzle of oil if it’s too dry. Serve at room temperature. You are currently browsing the archives for the salad category.